Balderdash: The classic bluffing board game. Playing the Balderdash board game can turn a quiet gathering into a laughter-filled occasion. You don't need to have a big vocabulary to enjoy this game - you just need to know how to bluff. The Balderdash board game is based on the old parlor game Dictionary, where players would be given four to five possible definitions for an obscure word selected by one of the players from the family dictionary. The parlor game was very popular because the only skill required was the ability to bluff all the other players. The well-loved parlor game was recreated and published as a board game in 1971 called The Dictionary Game. Game cards were included in the game with words and their real and "bluff" definitions. Players enjoyed this faster-paced version of the game because they no longer had to take the time to find obscure words in the dictionary and compose bluff definitions. In 1984 Mattel reintroduced The Dictionary Game with a new name - Balderdash. The final words were selected from over two million words. The game was updated in 2006 with the introduction of Beyond Balderdash, incorporating a new series of words and definitions. The Balderdash board game is a classic bluffing game. Players make up definitions for a chosen word. They earn points for their creativity in bluffing the other players with their made-up definition. They can also earn points for guessing the correct definition. The game can be played with as few as two players; however, the fun level increases with the number of players involved. Balderdash is a great icebreaker, so it is an excellent choice for a party or family get together. Even teenagers and shy players of all ages tend to get into the fun of making up crazy-sounding, but plausible, definitions. Players, ages 12 and older, can quickly get engrossed in the game which usually takes about 60 minutes to play. When the game starts, each player rolls the die. The player who rolls the highest count is designated as the "Dasher" who will select the first word and read the definition options. All players are given an answer sheet and a pencil. They select a colored playing piece and place it on the board in the space marked "START." The game starts with the Dasher selecting a game card which contains five words. The Dasher then rolls the die to determine which word on the game card will be played. For example, if a "1" is rolled, the first word is read, if a "2" is rolled, the second word is read and so on. If a "6" is rolled the Dasher may choose any of the words on the card. The Dasher reads and spells the word aloud to the other players. Each player creates a definition for the word that sounds believable and writes the definition on their answer sheet. The player initials the definition and the answer sheets are collected. The Dasher reads the definitions aloud twice. Starting clockwise from where the Dasher is sitting, each player chooses a definition which he or she believe is the correct definition. The Dasher takes notes on which player chose which definition. After all players have guessed, the Dasher reads the true meaning. One point is given to each player for every vote that is given for his or her definition. Two points are given to each player who chooses the correct definition. Three points are given to the Dasher if none of the players choose the correct definition. Three points are given to any player who submits a definition that is similar to the correct definition. The scores are totaled, and each player moves his or her playing piece the appropriate number of places on the game board. The player to the Dasher's left becomes the next Dasher, and the play is repeated. The Dasher can submit a bluff definition in addition to the real definition. This gives the players more definitions to select from. One player chooses one of the five words from the card and reads all five definitions to the other player or players. If the other player selects the correct definition, he or she scores two points and move two points on the game board. If the player selects the wrong definition, he or she only receives one point and moves one space on the game board. The first player to reach the space marked "FINISH" is the winner. 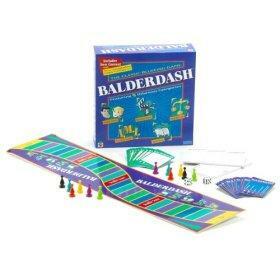 Balderdash Junior - This version was introduced in 1991 for two to six players, ages eight and older. Bible Balderdash - The words in this game center around Bible events. Most games take about 45 minutes and are best enjoyed by ages ten and older. Beyond Balderdash - This is the second edition of Balderdash and includes several new categories.